Hey there! Thanks for stopping by Flawed yet Functional today! Let’s talk about normal people decorating their homes with things they love. I love my home, DIY, and creating a beautiful space for my family to enjoy. Decorating your home doesn’t have to cost a lot of money or need a designer. Today I’d like to show you how to decorate a buffet using only what you have. Of course, this works for any flat surface: sideboard, credenza, sofa table, or fireplace! You can make your home beautiful and odds are you have plenty of things to work with right at your fingertips. Let’s get started! 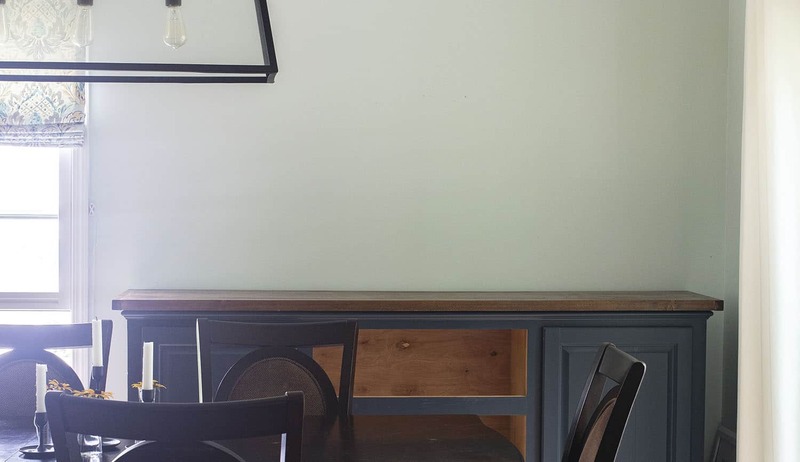 Two things happened last week that made me want to mention why I show my very-beginner DIY and decorating projects here on the blog. Clearly, I’m better at cooking and health topics than DIY/decorating, but I love it, so I choose to show it to you. So what happened last week? 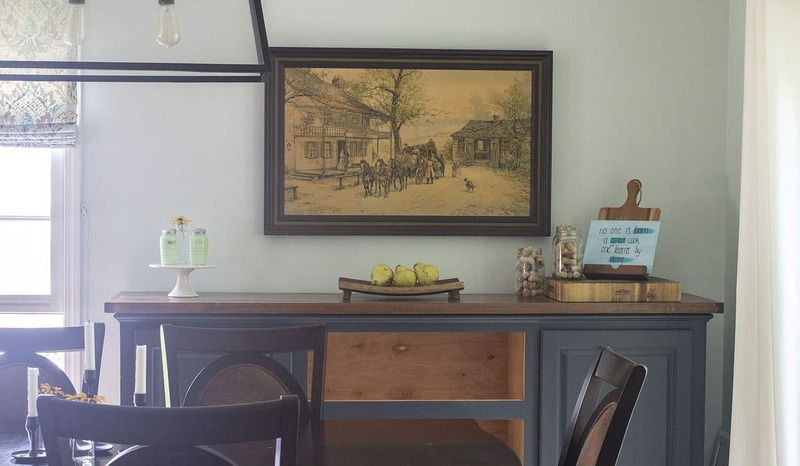 Young House Love’s podcast on renovation fatigue – One of the segments in their weekly podcast was about a general fatigue of seeing whole house, total home makeovers. Is it time for a step back to makeovers that are more feasible for the average American? Would you rather see small, use-what-you-have or, easy projects? Last I saw 78% of their listeners said “Yes”! I have to say that I wholeheartedly agree too. I’ve been feeling it for a while but hadn’t put it into words. Expensive or even just comprehensive (meaning whole-house) renovations are just not realistic to the average American. I want to see something that I either can do in my own home or learn a new skill then I could create it in my own home. The second thing was a bathroom reveal on a blog I love that just left me unsettled. It was beautiful, totally lovely, and yet, completely unrealistic that the vast majority of us could plop down that kind of money to renovate only a bathroom. I’m not judging them for doing it. They had the money (I hope! ), and it was something they wanted in their home. Good for them! It isn’t inspiring to me though, because that is just so far outside financial reality to me that it might as well been a superstar on HGTV instead of an average American’s blog. Inspiration is only inspiring if it is within reach. So here’s where my heart is at: I want to show you realistic updates, DIY, decorating, and projects that the average person with some tools and a can-do attitude could accomplish. Maybe you’d have to practice some (I do! ), maybe you’ll need to buy a new tool, but if you wanted to, you could do it. Will these projects have the same wow factor as the big name bloggers or shows on TV? No. Not likely. But I hope they inspire you to use that picture sitting in your garage, paint that table you’ve been planning to paint, and to step-by-step make your home beautiful and functional for your family. I hope you’re with me. 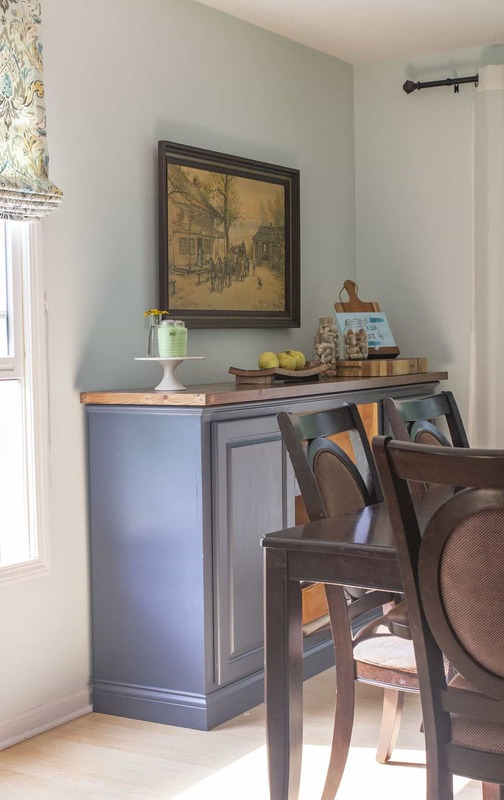 We’ll improve our painting/building/decorating skills together, one project at a time…without breaking the bank. Well that was a big soapbox! What were we talking about? 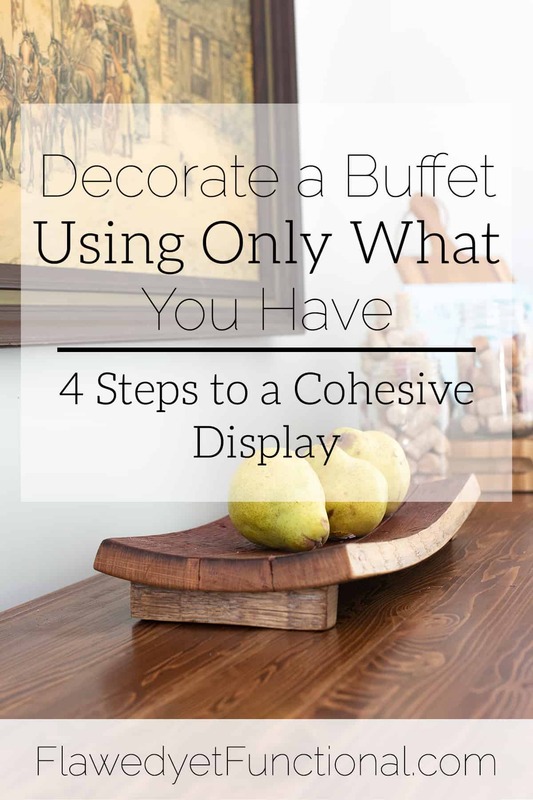 Oh right, how to decorate a buffet using only what you have! Let’s chat! This not-yet-finished-but-someday-will-be buffet was built for many purposes. Not only did I want the buffet for storage of infrequently used kitchen items, I wanted the top for food serving and decorating. I’ve been slowly collecting things I love that have purpose and yet are beautiful: a pair of jadeite salt and pepper shakers from my grandma’s house, a $3 cake stand from Target’s dollar spot, bud vases from Ikea, wood cutting boards, etc. My ultimate plan was to use these as decor and for their intended function when needed. Yesterday I took the time to pull the items all out of the buffet and garage, clean them up and put them out on display. Let’s start with the after because that’s what’s most important, right? And here’s a look at what I started with, a really blank canvas! 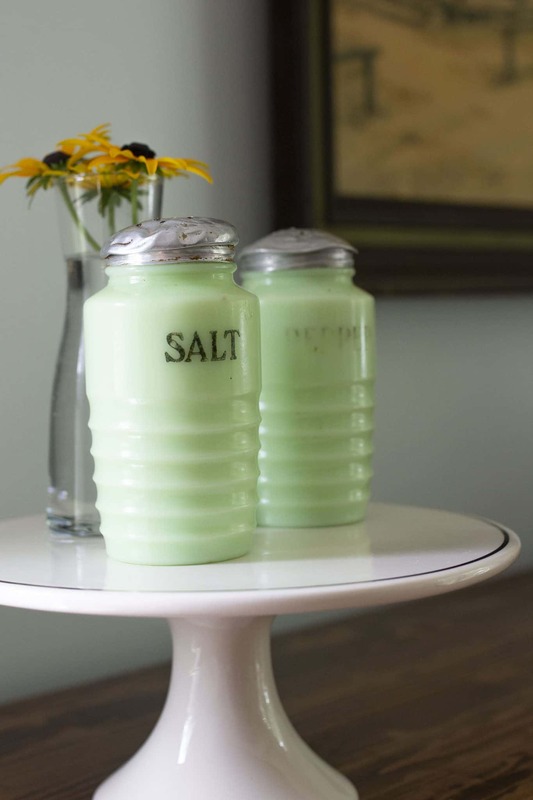 Breaking it down, here are my 4 simple tips to decorating a buffet using only what you have. I inherited the picture and frame from my grandma’s estate. Although I don’t mind the picture, it isn’t my favorite. I plan to put some of my husband’s photography work in the frame down the road. Until then, I love having a large scale picture in the room. It brings a finished, all-grown-up look to the room. This was the first piece I put into place. Next I pulled out my cake stand and thickest cutting board and placed them on opposite ends of the buffet. After mixing and matching smaller items standing on those, I landed on the jadeite salt and pepper shakes on the cake stand and the tablet stand with canvas on the cutting board. My goal was to end up with similar heights. If it wasn’t exactly the same, that was ok, but I did want the ends to be taller than whatever I put in the middle. To fill in my end caps, I added a bud vase with precious flowers picked by my boys to the left side and three Mason jars filled with wine corks on the right. To make the groupings look natural, use an odd number of items. They don’t need to be 1, 3, 5 of the same thing. I just happened to have a lot of wine corks so I filled three Mason jars, but I could easily have put 1 Mason jar plus two candlesticks or something like that. The two end cap arrangements are fairly small, so I didn’t want to leave the middle of the buffet empty. I have a wood serving platter that is made from the side of a wine barrel. (Are you surprised by how thick that board is?? I was!) So I set that in the middle of the buffet and topped it with some fruit. 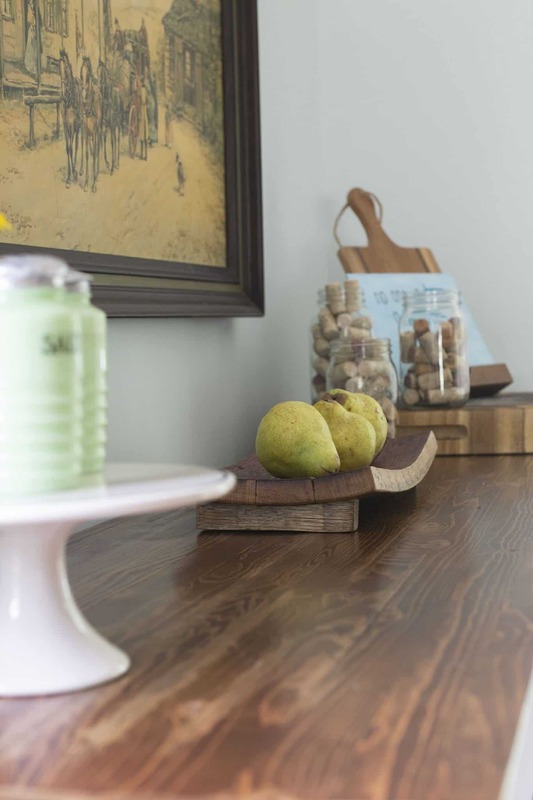 Simple and can serve the purpose of displaying fresh produce which is always lovely. Or toss some artificial fruit in it if you are likely to forget that real fruit is sitting over there! Including hanging the picture, arranging this took less than 20 minutes. You could probably do the same! 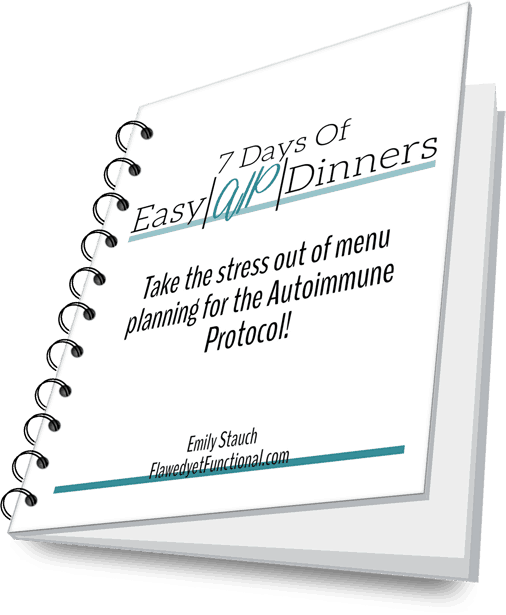 Pull out those pretty things you don’t use often. Decide on your focal piece and put it in place. Then work from the outside in to fill in the rest of the space. I bet you have plenty of items lying around in cabinets not being loved and appreciated. Just a little bit of time and you will have a room feeling fresh and new again! I hope you are inspired to decorate your flat spaces with items that you love. I’ve been staring at my newly decorated wall every time I walk through the room. It’s amazing what a little bit of effort will do for a room! 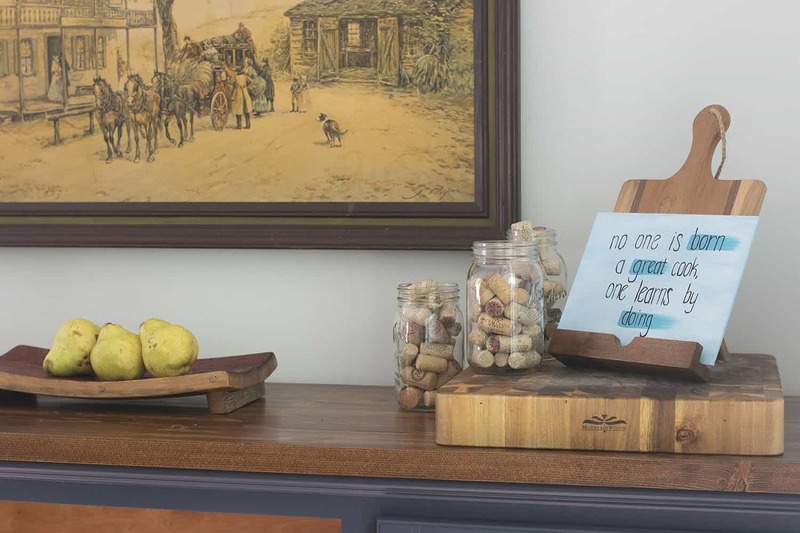 Try these 4 simple steps for how to decorate a buffet using only what you have. Be creative, put your lovelies on display and enjoy them! What space in your home could use some love? What is stopping you from decorating it? Care to try these four steps and share what you come up with?